- for iPhone & Android - Wireless, Rechargeable & Waterproof! 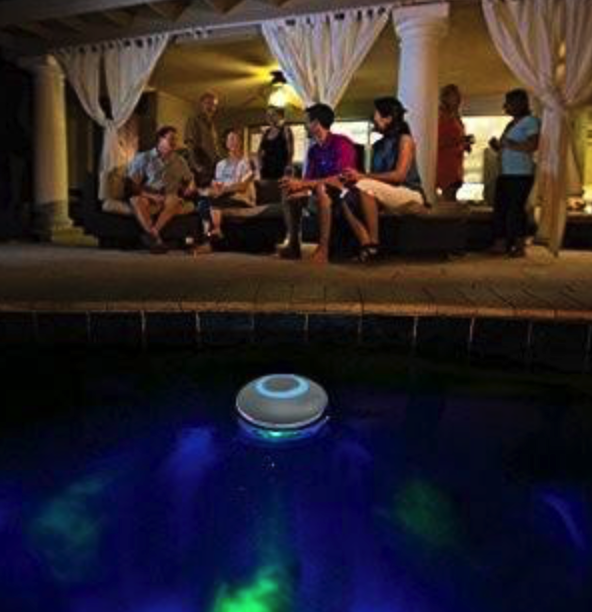 A quality floating Bluetooth speaker that is easy to use and will play your iPhone, iPod & Android music in the pool - synchronized with a stunning light show! Your music "in" the pool. Drop this floating Bluetooth speaker by the pool and enjoy your music played wirelessly directly from your iPhone or Android device. Its state-of-the-art sound quality is synced to a captivating light show. Ideal for parties, games, or simply for creating a nice atmosphere at the pool or anywhere outdoors. Impress your friends and entertain your family with this creative new gadget. Synch it: Synch multiple units for a better sound and visual experience. Easy to Use: Simply pair it to your device and enjoy the music. Answer Calls: Incoming calls will be notified via the speaker (user or caller id). Quality onboard waterproof microphone. Rechargeable: you can play the music and run the light show for up to 8 hours, and it does not require expensive batteries. Compatible: Fully compatible with any Bluetooth media device. Versatile: An onboard hanging loop allows you to hang it anywhere indoors or outdoors. Handy Controls: Power, track, volume and light show control buttons are located on the speaker for easy operation in the pool. Compatible with any Bluetooth streaming device.